100% on-line inspection with .3 Mega Pixel color cameras. 1/60,000 second shutter speed. Inspection on the fly at wire speed (arm speeds) up to 2.5 m/sec. Its not necessary to stop the wire for checking. Adaptable to many but not all automatic crimping machines. Not suitable for manual crimp presses. With or without strip check function depending on make and model of cutting machine. Calibrated dimensional checks of strip length, insulation diameter, copper diameter. Signals for stopping the cutting machine when defects are detected, or automatically cutting defects. Output signals in less than 100 ms after picture taking. User friendly easy to program crimp inspection software. Standard crimp inspection "tools" have been developed. This is not a general purpose vision system adapted to the crimp process. This is a vision system designed only for the crimping process. The number of critical circuits in today's cars is increasing as more sophisticated safety systems are being employed. The number of critical circuits in autonomous cars to support added cameras and sensors is far greater than today's cars. The reliability of the wiring systems required to support these new technologies has to be guaranteed. Today most crimps are inspected indirectly by Crimp Force Monitors (CFM's) and visually by crimping equipment operators. 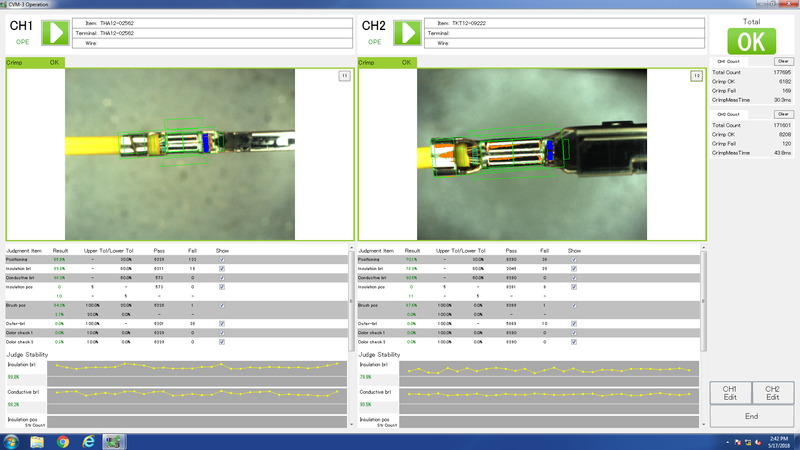 Crimp cameras are another tool that can be employed to further eliminate crimp defects from wire harnesses. Crimp cameras are retrofitted to existing automatic crimping machines to realize 100% on-line inspection of crimps. Defects that are difficult for traditional Crimp Force Monitors to detect are easily detected by crimp cameras. Some of these defects include strands pressed on top of the crimp, insulation crimp wing defects, small movements of the insulation position in the "window", single wire strand sticking out either side of the crimp, long brush, seal placement, etc. Additionally wire stripping can be checked as the wire moves past the camera on the way to the crimp press. Strip length, insulation diameter, copper diameter, wire splay all can be checked. Seals can also be checked for correct position, orientation, and size.